Tangent AMP™ is a Distributed Energy Resource Management System (DERMS) that monitors energy signals from the grid, the environment and your facility. Proprietary algorithms interpret these signals to predict economic opportunities. When these occur, Tangent AMP™ alerts customers and in conjunction with Demand Design™ actively manages pre-determined customer responses to maximize economics and minimize disruption. 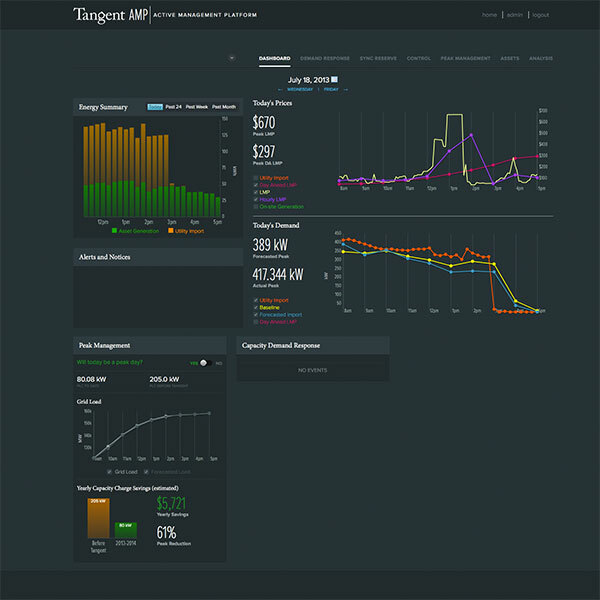 Tangent AMP™ combines a holistic view of your energy system in relation to the energy grid, timely notification and active management, into a single, turn-key offering.